The GX60 is a compact maritime stabilized terminal ready-to-use on Inmarsat’s high speed, Global Xpress (GX) broadband service. Built and supplied with an integrated GX modem the GX60 installs easily and delivers high speed connectivity in no time. For many years, upgrading satellite communications systems has been a logistical challenge, often relying on the availability of a shore-based crane and requiring extended time in port. The GX60’s small size, integrated design, and intuitive user interface means operators can install and commission the terminal in the same amount of time as a FleetBroadband system. Furthermore, with speeds up to 50Mbps, the GX60 delivers a strong return on investment. Standard VSAT below decks equipment can occupy entire server racks worth of space, depending on the network configuration. The GX60’s integrated design condenses multiple components into a single box, freeing up valuable storage space on board. The Intellian GX60 Below Deck Terminal (BDT) includes the integrated Global Xpress Modem and an 8 port Ethernet switch, which enables direct IP connectivity to a standard Wi-Fi router or the vessel’s on-board network ready devices. Once the simple installation process is complete users can be on-line in a matter of minutes. The BDT is also equipped with its own Wi-Fi antenna allowing wireless connection to your PC or Mobile device for monitoring and control of the terminal via Intellian’s Aptus software. 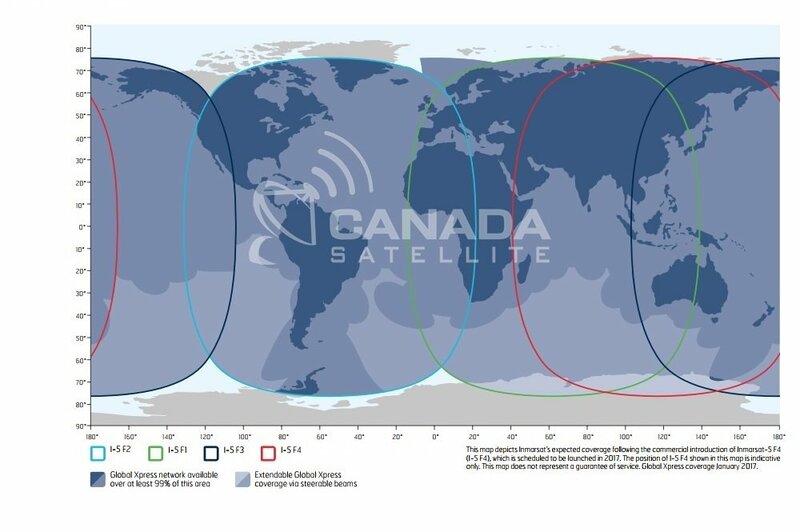 This map depicts Inmarsat’s expected coverage following the commercial introduction of Inmarsat-5 F4 (I-5 F4). The position of I-5 F4 shown in this map is indicative only. This map does not represent a guarantee of service. Global Xpress coverage January 2017.